Going Away for Spring Break? What You Need to Know About Bed Bugs. Spring break is upon us, and if you’re planning a vacation, then it’s important to do your homework ahead of time so you don’t end up bringing any little hitchhikers home with you. Of course, when we say “hitchhikers,” we mean bed bugs. As your NJ bed bug exterminator, we almost always get a surge of bed bug calls once spring break ends, so here are a few things you need to know. Checking hotel reviews for any recent reports of these pests. Spraying your luggage with a bed bug control spray before you pack for your trip. Upon arrival, put your luggage in the bathroom while you inspect the room. Check the mattress, sheets, pillowcases, bed frame and dresser drawers for signs of bed bugs. If you do find signs of bed bugs, ask for a different room, or leave and go to a different hotel altogether. Unfortunately, sometimes even if you’re really careful, you can still bring bed bugs home with you. If this is the case, your NJ bed bug exterminator can help you get rid of them. Don’t lose sleep over bed bugs! Contact us at Stern Environmental instead! help with the on-going battle. One very helpful item is the PackTite SC portable chamber. The newly updated device has revolutionized a way to kill bed bugs quickly and efficiently. The unit is 36″ long by 19″ wide by 24″ deep creating a chamber that is heated to temperatures between 118 to 125 degrees. The chamber can maintain temperature for an extended time ensuring all bed bugs are exterminated. This includes eggs as well as adults. With the PackTite SC, it’s easy to treat items that may be infested such as luggage or clothing used on a recent trip. If you have an infestation in your home, you can treat items such as linens, sensitive clothing items, and even items you send to the dry cleaner. It’s the perfect alternative for treating items you do not want to use chemicals or insecticides on such as children’s or pet’s toys or items that can’t be traditionally treated. The PackTite SC takes up minimal space when in use and when it’s time to store it the chamber it collapses to only 11 inches high. There are many items available, from beg bug monitors and mattress covers to the PackTite Closet for treating and storing items. 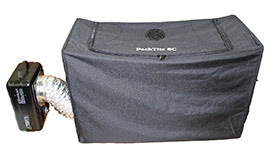 For information about the PackTite SC, and help with bed bug problems, contact Stern Environmental Group. Understandably the family is concerned about bringing the blood thirsty pests back home to New Jersey as well. It is important that they take precautions to avoid transferring bed bugs upon their arrival back home. All clothing must be laundered in hot water and dried on the hottest heat setting. 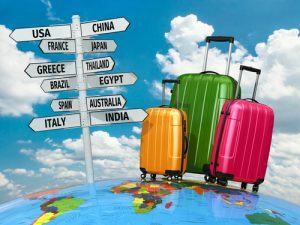 Additionally, all luggage pieces should be carefully vacuumed inside and out, paying close attention to the seamed areas as bed bugs are excellent hitchhikers and bed bug eggs are nearly impossible to detect. Despite this family’s best efforts to avoid bringing bed bugs into their home, there is still a possibility that an infestation can occur. It takes only one pregnant bed bug or two hatched eggs to create an eventual full-blown bed bug infestation. Stern Environmental Group has a variety of products to help keep homeowners safe from bed bugs. • The Bed Moat: Place the “moat” under your furniture legs or bed frames to trap bed bugs when they come for a blood meal. The textured exterior enables the creepers to crawl up, but the slick interior traps them inside. • NightWatch Bed Bug Monitor: This bed bug trap and monitoring device will attract and kill bed bugs. This amazing unit mimics the chemical patterns that a sleeping human does so bed bugs migrate towards the trap to their death! • Termite and Bed Bug Detector: Bed bugs don’t stand a chance against the TDS! This incredible device will alert you when there are bed bugs that are hiding in your home. It’s so sensitive that it will detect as few as one bed bug. As a bonus, you can also locate termites too! 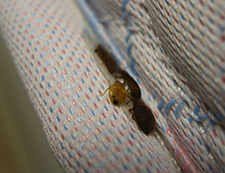 Bed bug infestations are not a do-it-yourself type of pest. Left untreated, bed bugs will multiply very quickly and spread throughout an entire structure. If you think you have bed bugs in your New York or New Jersey home or business it’s important to call a licensed pest control expert immediately. Providing 24 hour emergency service, Stern Environmental Group will be able to effectively eradicate your bed bugs quickly and safely.